Tripp Lite's B118-002-UHD HDMI Splitter allows the 4K2K digital signal from a Blu-Ray player or other HDMI device to be displayed on two HDMI displays. Installation is quick and simple, with no software or drivers to install. Tripp Lite's B118-002-UHD HDMI Splitter allows the 4K2K digital signal from a Blu-Ray player or other HDMI device to be displayed on two HDMI displays. Or, you can connect a DVI-D Single Link display using an HDMI to DVI adapter. Installation is quick and simple, with no software or drivers to install. Locate your HDMI source up to 16.4 ft. (5 m.) from the splitter, and the splitter up to 16 ft. (5 m.) from a display. Supports full 3D and video resolutions up to UHD 4K x 2K 3840 x 2160. High Speed HDMI and 3D compliant, with support for 36-bit Deep Color (12-bits per channel). Supports DTS-HD, Dolby True HD, Dolby Digital Plus, and LPCM 7.1 Channel Surround Sound audio. Tripp Lite’s B118-002-UHD 2-Port 3D 4K HDMI Splitter separates an HDMI audio/video signal for display on two different monitors. A built-in cable connects to the HDMI source (computer, Blu-ray™ player, DVR), and two HDMI outputs connect to monitors using high-speed HDMI cables, such as Tripp Lite’s P568-Series (sold separately). The B118-002-UHD can be placed up to 16.4 feet (5 meters) from an HDMI source and up to 23 feet (7 meters) from a connected monitor for a total distance of almost 40 feet (12 meters) from source to display. The B118-002-UHD supports 4K x 2K video resolutions up to 4096 x 2160 (@ 30 Hz), as well as full 3D digital video, 36-bit Deep Color (12 bits per channel) and xvYCC/x.v.Color. It’s compatible with HDCP and EDID content standards. It also supports DTS-HD, Dolby TrueHD, Dolby Digital Plus and LPCM 7.1-channel surround sound. This splitter has a video amplifier bandwidth of 340 MHz/3.4 Gbps per channel (10.2 Gbps total) and supports lip sync pass through. 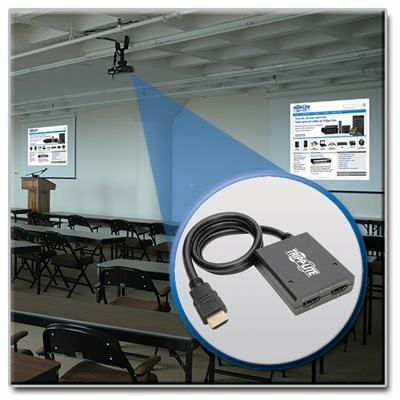 With no software or drivers to install, the B118-002-UHD is easy to use, making it ideal for schools, retail locations, point-of-sale displays, trade show booths, conference rooms and other places that require connection of two UHD displays to a single UHD video source. Plug in the unit’s external power supply, connect the unit to the video source and remote displays, and enjoy high-quality picture and sound. The B118-002-UHD comes with a 3-year warranty. It’s manufactured in compliance with strict RoHS specifications, reflecting Tripp Lite’s commitment to environmental responsibility.